Lady Skywriter: D.B. Cooper? . . . Again? Lady Skywriter: D.B. Cooper? . . . Again? D.B. Cooper? . . . Again? In 1971 a man known as Dan Cooper, later misidentified as D.B. 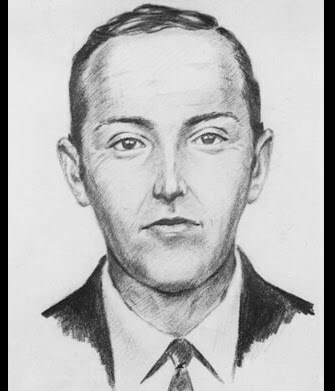 Cooper, successfully hijacked NWA Flight 305, a Boeing 727 bound from Portland to Seattle, and parachuted out of the jet into the wilderness of Southwest Washington with $200,000 in cash. In the nearly 40 years since, D.B. Cooper has become a legend and multiple theories explored, all coming to dead-ends. Imagine my surprise yesterday, when I heard from Jim Anderson, a retired NWA'er currently living in Arkansas, that the latest belief as to the identity of D.B. Cooper is that he was non-other than a NWA flight attendant/purser named Kenny Christiansen. This news had to come to me this week, right? The same week that Steven Slater "pulled the chute" and slid to fame and notoriety clutching (was it one?. . . or two?) beers. Anyway, Jim Anderson had read a book published in May of this year, "Into the Blast: The True Story of D.B. Cooper," by Robert Blevins and Skipp Porteous. Jim picked up on a technical error in the book relative to what the NWA co-pilot was reported to have said in an interview, and contacted Robert Blevins to alert him to the error. Since then, Jim has learned that The History Channel is planning to do a show about the book and they are looking for any additional information available about Kenny Christiansen. He has received calls and E-mails from both authors and from The History Channel. Jim called me, wondering if I knew anything about Kenny Christiansen. "Not until now," I replied. He asked if I would contact other folks associated with the NWA History Centre with the question and I agreed. In the meantime, I'm busy reading the book and wondering how all of this will play out . . . I'm looking for more information about The History Channel show, which is supposed to air in about two weeks. If I come up with anything you can be sure I'll let y'all know about it. Signing off as A.B. Kerr, sans $200K . . .
P.S. Whatever happened to Steven Slater? The History Channel show is 'Brad Meltzer's Decoded'. The episode airs on Thursday, January 6th at 10PM Pacific/9 Central. An updated edition of the book will be released the same day the show airs. If you missed the show, you can view the entire Decoded episode (without commercials and in hi-def) at the Videos page at Adventure Books of Seattle. Who Is This Young Lady? This story has a "Twist"